President Barack Obama is once again going to us, the young people, in his bid for re-election this fall. And he is going to an area that we all can (or in the future) identify with: the pain of student loan debt. Obama spoke to a college-age crowd at the University of North Carolina Chapel Hill on Tuesday that he knows first-hand about the burden of student loans because he only managed to pay his back eight years ago. "Michelle and I, we've been in your shoes," Obama said at Carmichael Arena. "Check this out, alright. I'm the president of the United States. We only finished paying off our student loans about eight years ago. That wasn't that long ago. And that wasn't easy - especially because when we had Malia and Sasha, we're supposed to be saving up for their college educations, and we're still paying off our college educations." 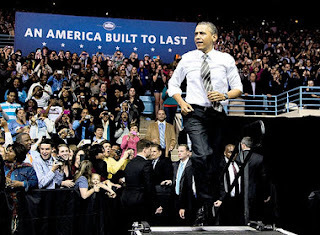 His stop in North Carolina was the first of a two-day campaign-style swing through battleground states to reengage young voters who powered his historic 2008 campaign but seem less enthused about the 2012 campaign. His chief policy message was an appeal for Congress to renew legislation to stop interest rates on subsidized Stafford loans from doubling July 1 from 3.4 percent to 6.8 percent. The White House has been working with Congress to find a way to pay for the measure, which would cost $6 billion, but much like the campaign to pass the payroll tax-cut extension and the "Buffett rule," the president has taken the case public. Like so many American couples, the Obamas paid more on their student loans than they did on their mortgage during their first eight years of marriage. His emphasis on his modest upbringing seemed designed to invite comparisons to Republican nominee Mitt Momney, attacking his personal finances as a multi-millionaire financier. This approach from the president seems to be effective as student loan debt greatly outpaces all other debt, making the dream of a college education seem futile. Are you also worried about your student loan debt? Although Mitt Romney supports a temporary extension of current loan interest rates, which candidate is easier to relate to? Speak!